It is the middle of winter, short frigid days and long dark nights. I find myself lighting the candles, wrapping myself in a blanket, and increasing my television consumption. I know, I know, not the most effective or efficient use of my time but I’m a TV junkie. Luckily, I have been able to combine my love of TV with organizing by binge watching organizing programs on Netflix. If you have access to Netflix and you’ve ever wondered what an organizer does, and what they can offer you, then watch a few episodes of “Consumed” and “Tidying Up with Marie Kondo”. Now there is one caveat I have to my previous statement. These are televisions shows after all and television is made to be sensational, to draw you in, which is why we love to binge watch. The shows are just a glimpse inside a person’s private life (their home) and the chaos created through overconsumption. As an organizer I can see beyond the sensation and read into, for as much as the program allows, what is really going on in the lives of these people. Sometimes I want to reach through the screen and offer my assistance. That interest and excitement reminds me why I love helping others find a better quality of life through organizing and decluttering. Whether you’ve watched the programs or not I thought I’d share a little of my insight into what makes the program work and what may be lacking. Consumed: With a firm but caring hand, organizational expert Jill Pollack helps overwhelmed families declutter their homes and their lives. (Netflix) Jill’s method has each family pack-up all their belongings, store them off-site and live with only the essentials for two weeks. After two weeks, the families are reunited with their belongings and asked to get rid of 70% of their possessions. Everything passes through their hands so they must connect with each object and determine if it stays or goes. The method takes people out of their comfort zone and demonstrates the arc of emotions people have during the process: overwhelm, hesitation, acceptance and finally freedom from their possessions. Each episode shows how our excess possessions are just a manifestation of an underlying problem. The possessions aren’t the problem in and of themselves, but by reducing the amount of possessions we own we have more time and energy to focus on finding the energy and happiness we seek. Nearly every family lets go of 70% of their possessions, and when Jill revisits them after three months most are continuing to let go and implementing or maintaining more quality time together. It is an intense method that isn’t affordable or practical for everyone. There are a few episodes that show people with serve issues, such as hoarding, and would require the added expertise of psychologists or therapists, along with that of an organizer. These issues are not addressed. The organizing solutions shared come in the form of a handy-man, who repurposes some of their furniture; they don’t provide you with low cost/no cost solutions you can implement yourself. 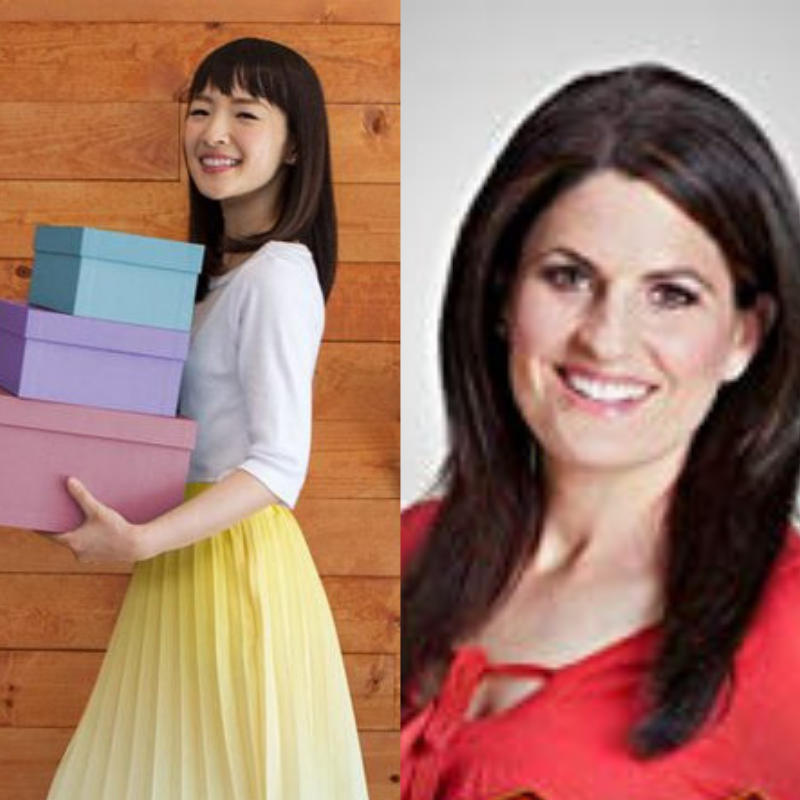 Tidying Up with Marie Kondo: In a series of inspiring home make-overs, world-renowned tidying expert Marie Kondo helps clients clear out the clutter – and choose joy. (Netflix) Marie Kondo helps her clients tidy by implementing her method of folding and storing items, through the process clients reduce their number of possessions. Marie makes it clear to her clients that she doesn’t possess magic, but you can find that illusive magic within yourself. The magic isn’t, like the wave of a wand, the transformation of the home, it is the transformation within, showing how you feel lighter and happier, have joy, because you have less stuff and more time to do what you love. Peppered throughout each episode are Marie’s methods for folding and storing items. It is a practical DIY guide on how to implement her method without the assistance of an organizer. For those who have read her book these will be recognizable. Each episode represents nearly every type of client an organizer could potentially work with, from new parents, to empty-nesters, young 20-somethings to retirees, and those blending homes together, dealing with the personal effects of a loved one lost or preparing for a new phase in life. Marie’s style is very practical and deals with surface level emotions; the show glosses over those struggling and doesn’t show Marie supporting or guiding those needing more emotional support during the “tidying”, i.e. letting go process. Her method focuses on tidying, and that is her strength, but you never tidy what you don’t need to keep. The simple question of does it “spark joy” was sometimes too simple for individuals who found “joy” in everything and weren’t prepared for decluttering. How people found their joy. While people were open to the process many struggled with the method and the idea of letting go, and then it would jump to the end and they would be happy and relieved. You missed how they made the transition. In both programs there were two things the organizers made clear, you must know why you want to organize your home and that you, not the organizer, need to do the heavy lifting. There is a common misconception that an organizer will come in to your home and clear the clutter for you. Your possessions are yours and the attachment you have is personal, which means the decision to keep or let go is determined by you, not the organizer. The organizer is there to coach you through the process, when you get stuck, to keep you on track, and to offer advice and solutions on how best to store and maintain items. In nearly every episode of both programs I was able to relate to the person’s experience whether it be like my own, or someone I know, or that of a client I have worked with. It helps being an American and seeing it through that lens. Many will be put off by the fact that Americans have TOO MUCH STUFF, in excessively large homes that may not be relatable across other cultures. If you don’t see yourself in the people on the screen, that’s ok, but know that many of us are struggling to manage the influx of stuff in balance with the joy we want out of life. If you yourself, or someone you know, is facing this struggle, enlist the help of an organizer and get consumed with joy. This entry was posted in Uncategorized and tagged consumed, declutter, konmari, organize, tidy by sorted.by Melissa. Bookmark the permalink.